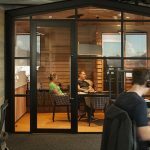 Iconic Kiwi brand Icebreaker have merged both their Wellington and Auckland offices and have its headquarters in Ponsonby, Auckland. They wanted to create a collective & exciting space which would reward the commitment of their employees and unify the two groups. The key drivers for planning the space were derived from their concept of ‘born in nature, worn in nature’. 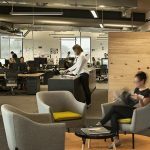 The fitout was split into the ‘Born’ side (internal functions – staff spaces and production) & ‘Worn’ side (external functions – client suites and finished product) which were visualised by the different material choices and finishes. 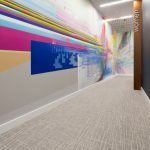 To capture the essence of the Icebreaker brand, the concept of connection to nature was achieved through real tactile natural materials and where possible, opting for non-toxic and raw materials such as Tretford goat hair carpet.